With Words to Sweat by closing its doors for good on December 31, 2015, I want to close up shop in style. So, I contacted the wonderful ladies at Fit Bottomed Girls to find fitness-loving homes for the last of the I’m No Slouch™ organic cotton infinity scarves. And as a thank you for their support and yours over the last six years, I am offering an exclusive deal to all FBGs. These organic cotton infinity scarf is currently on sale in the Words to Sweat by Etsy shop for $25, but for FBGs purchasing them below, they are $15.00 each until they’re gone. There is a limited amount left so purchase them now for family and friends, as well as fitness-focused clients and colleagues. The I’m No Slouch™ organic cotton weightlifting motif infinity scarf sits so cozy and close to your ears that it will whisper a gentle reminder to fit in some daily fitness. 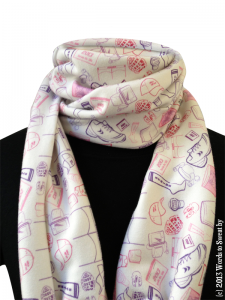 This super soft and supple organic jersey knit ‘slouchy’ scarf measures 29″ x 10″ and is printed on very light grey fabric with weightlifting-inspired images in hues of pink and purple. The print is an original and exclusive Words to Sweat by design and includes: barbells, dumbbells, elastic bands, workout mats, kettlebells, medicine balls, and jump ropes. To purchase a scarf (or two) simply click the BUY NOW button below. If the weightlifting motif isn’t your style, the running motif just might be and, it too is offered at a $15 exclusive. The BUY NOW button below will add a running motif scarf to your car.